Kent Museum of the Moving Image has teamed up with Talking Pictures TV (Sky 328, Freeview 81, Freesat 305, Virgin 445) to bring classic British cinema back to the big screen in a month-long season of free screenings at Kent MOMI. You can download a printer-friendly version of the programme for the full season here. You can download an A3/A4 display poster for the full season here. Tickets are available, free to book online at www.kentmomi.org/events (or at the bottom of this page) or by phone on 01304 239515. ‘Talking Pictures TV at Kent MOMI’ begins with The Boys, Sidney J. Furie’s courtroom drama about an ill-fated night on the town which ends in murder. For its combination of “over-the-top characterisations and true-to-life environments” one reviewer called it “Dickens circa 1962”. Double Confession was one of the BFI's “75 Most Wanted” lost films until it was rediscovered in 2013. This 1950 feature pairs William Hartnell, the original Doctor Who, and creepy horror star Peter Lorre as homosexual lovers suspected of a murder in an English seaside resort. A gritty wartime drama from Carol Reed, the Oscar-winning director of The Third Man, The Stars Look Down reunites the stars of Alfred Hitchcock’s The Lady Vanishes, Michael Redgrave and Margaret Lockwood, as a bright lad from a coal mining background and the manipulative girl he marries. The miners' struggle for safe working conditions remains relevant to this day. I Lived with You is Ivor Novello’s 1933 film adaptation of his own hit stage play about a homeless Russian prince who is taken in by an ordinary London family. Director Maurice Elvey directed Gaumont’s first talking film and Britain’s first film in colour. An almost unrecognisable Jack Hawkins, aged 22, plays jealous boyfriend Mort. 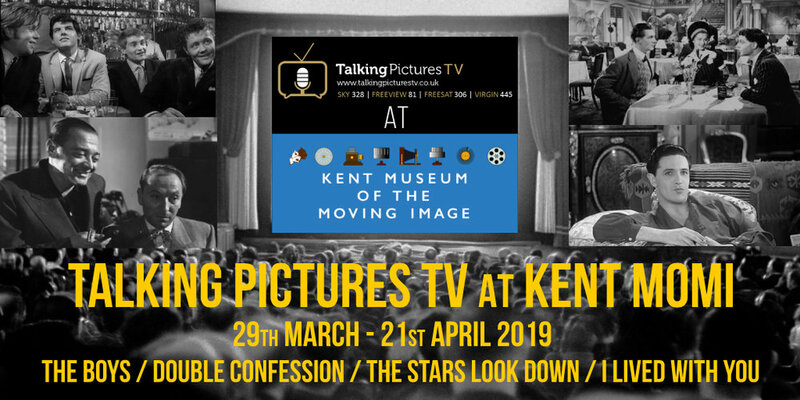 Fans of Talking Pictures TV enjoy exclusive priority booking throughout February when they pre-pay their visit to Kent MOMI’s exhibitions, the highlight of which is Passport to Ealing: The Films and Their Posters, 1938-1958. The exhibitions are open from 12 midday until 6pm on the day of each screening, and a ticket is valid for repeat visits to Kent MOMI for 12 months. Prices (valid until 30th April 2019): Adult £5.50, Concession/U16 £4.00. Screening tickets go on general release, free to book online or by phone, from 1st March.